We arrived from Turin on a small Regionale train which got progressively more crowded as we neared Alba's station. 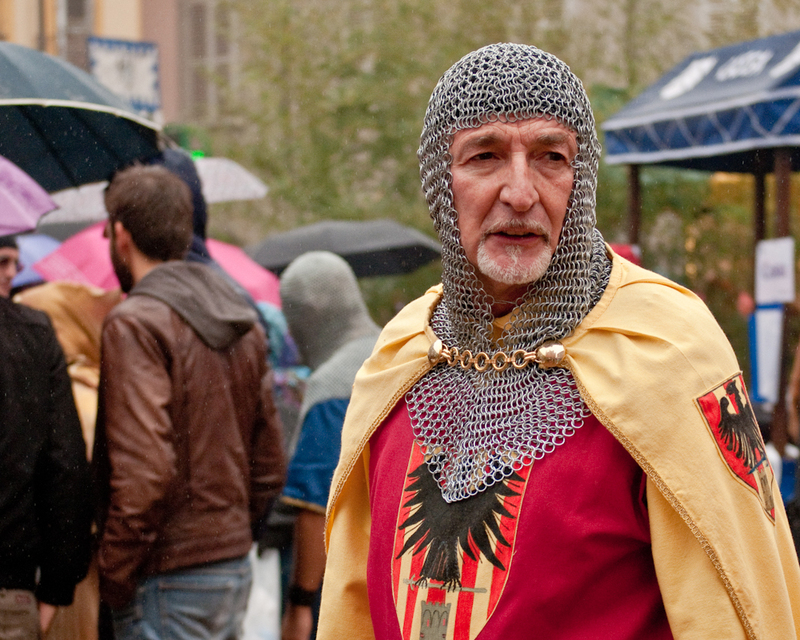 Everyone was headed for the medieval fair, just one of the many events during Alba's Truffle Festival. Alba is an ancient Italian town situated among the rolling hills of the Langhe in Piedmont. The unique terroir of Langhe not only produces some exceptional grapes and hazelnuts, it is one of very few places in the world where white truffles grow. Every fall, starting in the middle of October, they really make an event of it. The town hosts a huge Truffle Festival and Market, Fiera Internazionale Tartufo Bianco D'Alba and Albaqualita. You can see the complete program here. Most of the festival's activities are scheduled on the weekends; there is a donkey Palio, parades in period costume, flag throwing exhibitions, wine and cooking classes, stunning vineyard walks, live music, street markets, and many special tasting menus featuring truffles, to name just a few. For this weekend's Festa Medioevale, the town's historical center was filled with elaborately decorated food stalls, serving up traditional Piedmontese cuisine. There were pigs on spits, wine poured from ceramic jugs, cauldrons of polenta, amazing food of every description with the aroma of truffles everywhere. It was drizzly and a bit chilly, but this didn't stop hundreds of visitors from pouring in to partake in an afternoon of food, games and lots of wine. Win a bottle of wine by dropping a ring around the bottle's neck before time runs out. Porchetta roasting over an open fire. This game reenacts Alba's Palio D'Assini. Contestants bounce up & down in their saddles in order to inflate a balloon. The first one to pop it wins! The event reminded me a lot of the Sagre D'Asti, each Borgo (or borough) offered a select menu of their specialties paired with a glass of wine. You purchase tickets at one stall and collect your meal at another spot, closer to the cooking area. There was a lot of meat on the grill, delicious porchetta, and giant trays of farinata, steaming plates of polenta, risotto and fresh pasta mounded with shaved black truffles, and tiny agnolotti with sage butter. It's easy to feel overwhelmed. I learned at the Sagre D'Asti to head for the booth with the longest line-up, the locals are never wrong. Our wait in line was rewarded with fresh Tajarin pasta and shaved black truffles dripping in butter. This was our favorite dish of the day, and the competition was fierce. Tajarin is a very traditional Piedmontese pasta, it's a delicate, thin, flat noodle rich with egg yolks. 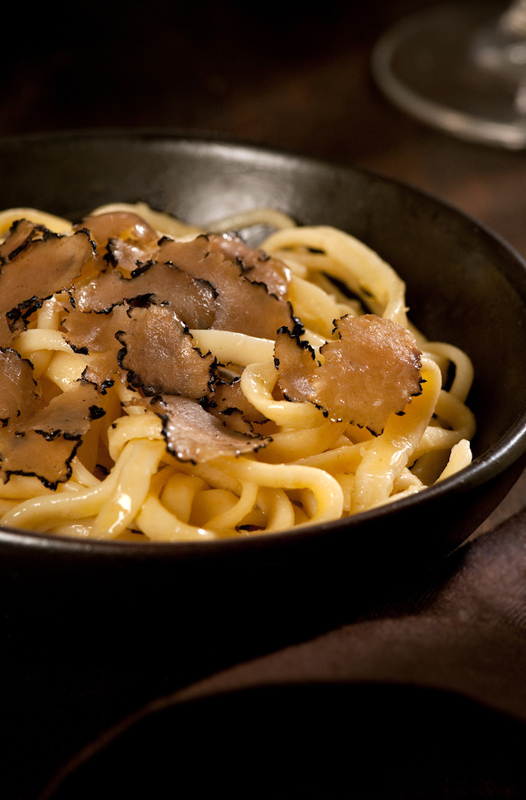 Commonly served with a ragu sauce, but during truffle season, tajarin served simply with butter and truffles is the way to go. I don't speak much Italian, but a few key phrases have served me well. "Come fare questo?" is one I use a lot, it means "how do you make this?". When I asked about tajarin, the responses varied, some recipes called for between 20-30 egg yolks for 1 kilo of flour plus a little water. This seemed a bit excessive to me, so I did some more research. Nonna Genia Classic Langhe Cookbook has a recipe for tajarin which calls for 4 whole eggs and 5 cups of flour, this seemed a little more reasonable. I started to experiment with small batches, until I was able to recreate the texture and flavour of the pasta I was served in Alba. In order to get the lovely golden colour, farm fresh eggs are needed, the pale yellow yolks in grocery store eggs just won't do. First, mix together the egg yolks, water and oil in a small bowl using a fork until combined. Pour the flour on to a clean work surface in a mound, and make a well in the center. Pour your egg mixture into the well and gradually incorporate the flour into the wet ingredients with your fingers. The ingredients should eventually come together into a ball. You may need to add a bit more water if it's too crumbly. Wrap the dough in cling film, and let rest at room temperature for 30 minutes or so. Divide in half and roll out the dough on a lightly floured surface until it is very thin, almost translucent. Dust the pasta with flour, and loosely roll it into a log. With a very sharp knife, cut the roll into very narrow strips. As you go, toss the cut noodles in flour to loosen them and prevent them from sticking to themselves. Let the pasta dry for a bit before cooking, maybe an hour or so. It is definitely quicker to use a pasta machine to roll and cut fresh pasta, and you will certainly end up with more uniform results than doing it by hand, but I opted for a more rustic approach for this recipe. I like the irregularity of hand cut noodles. To serve, simply cook the pasta in a large pot of boiling, salted water for 3-4 minutes, just until tender. Drain the pasta and toss with 2 tablespoons of melted butter per serving and top with freshly shaved black truffle, as much as you dare.